& trash disposal 365 days a year! 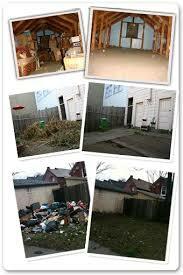 Everyone is busy these days, so it can be tough to make sure you keep your home and its surroundings are free of junk. It’s a good idea to cultivate a few habits that will help things stay clean, neat and organized – which in turn will cut down on daily cleaning because you will have more room for the things you keep. If you work on reducing junk for an hour or two a month, you’ll find that you save a lot of time in the long run. Let’s discuss a few ideas that can help. Many people go through a lot of printer paper throughout the course of their year. It’s a great idea to get a recycling bin and go through any papers at the end of the day or week to make sure you are getting rid of printed materials you don’t need. If you receive a lot of deliveries, odds are that you have a number of old cardboard boxes around. Break down these boxes and recycle them at the end of the week. Only keep them if you are planning on packing up for a move in the immediate future. Closets can become completely full of older items, making it hard to keep your clothes organized and just as tricky to get newer, better-fitting items into your home. Luckily, it’s especially easy to get rid of old clothing. Most cities have many local organizations that will accept them. The more you keep household surfaces clean and dusted, the less clutter you will want in your home and the more motivated you will be to get rid of junk before it starts to pile up. If you feel like you just can’t get around to tackling junk, start slow with light cleaning instead. Sometimes, the easiest way to deal with junk is to start over from the beginning. That’s when you should call your friendly neighborhood junk removal professionals here at Advance Junk Removal. We can help you with even the toughest junk removal tasks, whether you need us to get rid of yard waste, clear out old appliances or even clean out your entire property. Here in the Kelowna Area, if you need it hauled Dump It! 365 are the ones to call. Not only can we help you with the widest range of junk removal tasks, but we also recycle up to 100% of all the junk we collect, so you can feel confident you’re doing your part for the environment. When you’re ready to get rid of your junk and extra clutter, give us a call 250-807-7772 we offer amoung th cheapest rates in the industry! Call us and save some cash! Kelowna Junk Removal – Spring Cleaning For The 21st Century – Tips & Tricks! Kelowna Junk – Upcyclig – Trash to Treasure! Junk Removal Kelowna : Dumpit 365 © 2019. All Rights Reserved.